The Great Blue Hole is the largest sea hole in the world. It is located around 100 kilometers offshore from Belize City. It is also known as the Belize Blue hole. It is a part of the Belize barrier reef system. It measures about 1,000 feet in circumference and approximately 400 feet in depth. It is estimated to have formed at the end of the last Ice Age when rising sea waters flooded a series of enormous caverns. This sea hole has been designated as a World Heritage site by UNESCO. The Great Blue Hole was discovered by Jacques Cousteau for the first time in 1972. Cousteau and his team charted the depth of this sinkhole from their research vessel Calypso. This name was given by a British diver and author Ned Middleton. It is visible from space and can be easily identified by its unique circular shape. The underwater caves in this hole are filled with giant stalactites. It shows that it once existed above water. It is home to numerous limestone formations that are affected by the karst phenomenon. Only experience divers are allowed to dive in this sea hole. One must have completed 24 successful dives. The Belize Barrier Reef was declared the most remarkable coral reef in the Entire Caribbean by Charles Darwin. The Blue Hole Monument is one of the seven wonders of the Belize’s World Heritage site. Declan, Tobin. " 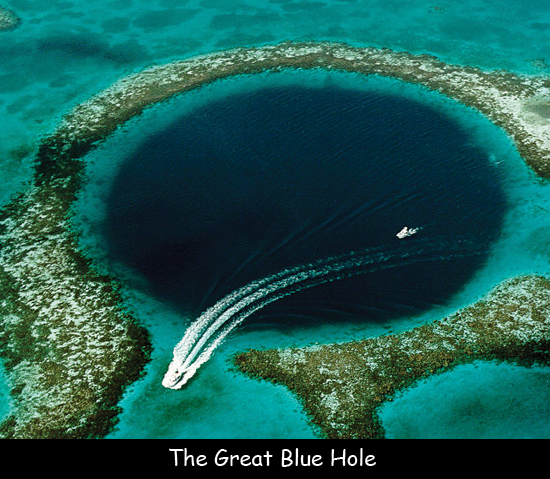 The Great Blue Hole Fun Facts for Kids ." Easy Science for Kids, Apr 2019. Web. 23 Apr 2019. < https://easyscienceforkids.com/great-blue-hole/ >.